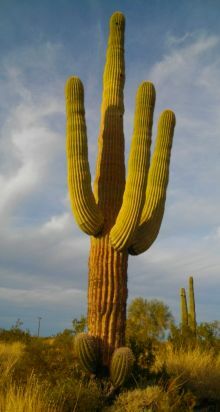 A stately saguaro cactus near camp. 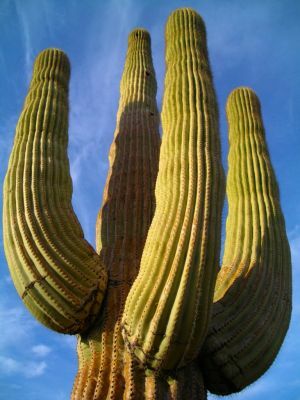 A closer look at the ‘arms’ of the cactus. Remember, look down too! 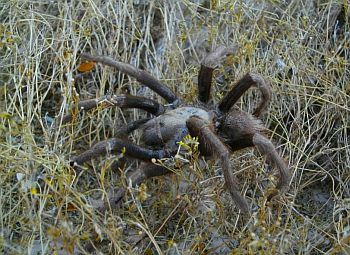 This tarantula wasn’t too far away! We took a 5 mile walk cross-country without Mavrik, he was recovering from the 8 mile walk yesterday. 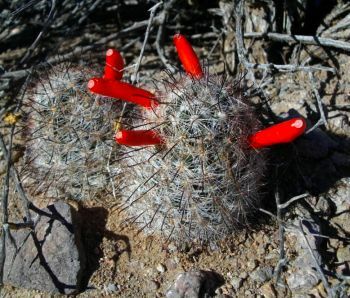 We found this cute tiny pincushion cactus under a bigger bush. The 1 inch long fruit is eaten by little desert rodents. After lunch we took a motorcycle ride, again without Mavrik, he hasn’t learned to sit on a motorcycle. 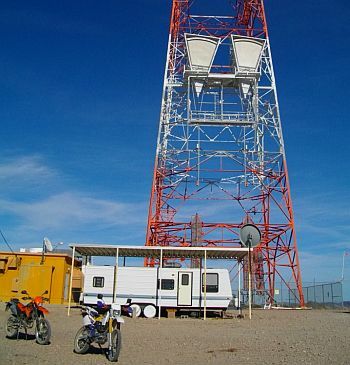 We rode up to a communications tower then into the desert. We don’t know who stays in this trailer, but it must be mighty hot in there! 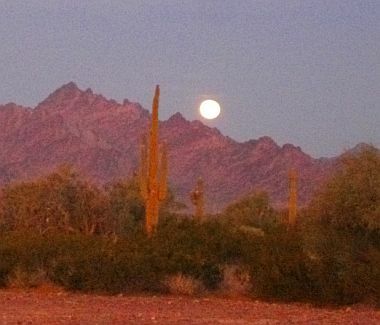 An early morning moon-set to the west. And turn around to the east to view a beautiful sunrise! 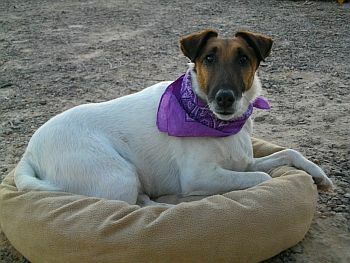 And a cute picture of Mavrik, cowdog! 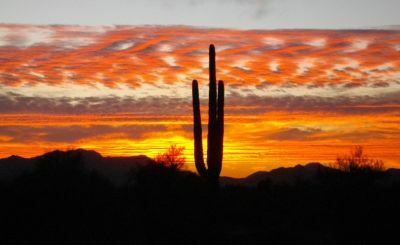 A gorgeous end to a great day in the desert. 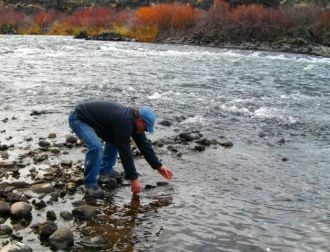 Actually we went into town to do errands and resupply, but we had a wonderful evening back at our campsite. 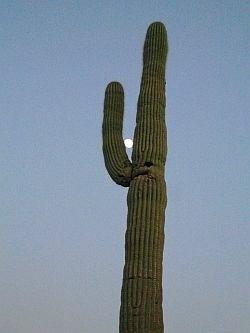 The moon, like a pearl, nestled in the arm of a saguaro. 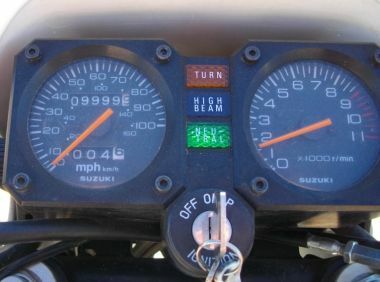 A big milestone, my bike turned over 10,000 miles!!!! 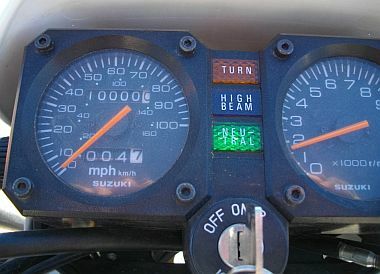 Of course I didn’t put all those miles on by myself, but I did a lot of them since 1997! Less than 1 mile from camp and I caught the last tenth of a mile on the odometer. On the way to Palm Canyon to view the only native Arizona palm trees (which incidentally are California fan palms, Washingtonia filifera). 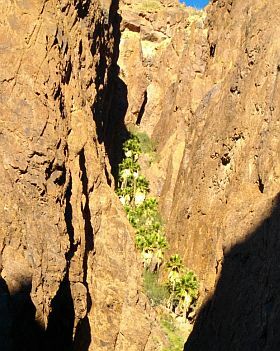 The palms are in a narrow side canyon, high up on the sides of the main canyon. 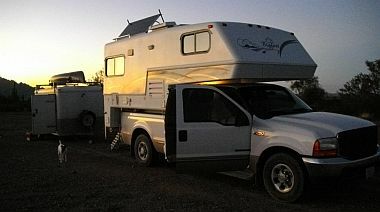 We found a nice spot on the way into the Kofa National Wildlife Refuge just south of Quartzsite, AZ. The sunset reflected on our ‘house’ (for the time being). 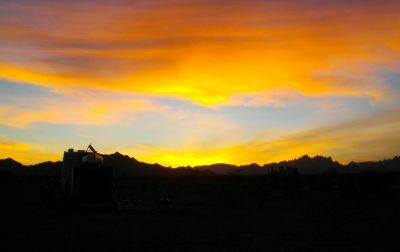 We spent the night in Searchlight, NV. Who would have thunk it? But the sun was going down and we needed to stop. 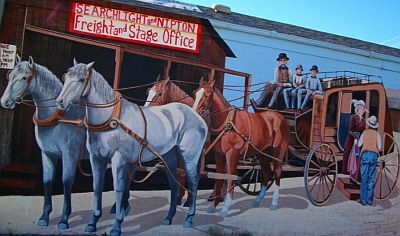 A colorful mural in Searchlight. 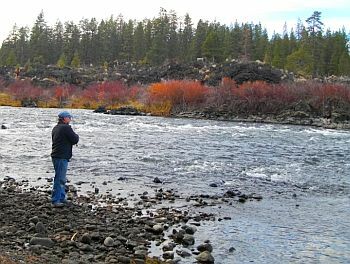 A beautiful day to take a walk down to the fishing hole and toss a line in! Line in, with a beautiful backdrop of fall color. 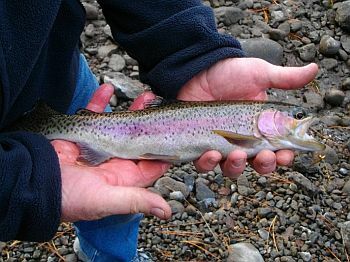 Catch a beautiful rainbow trout! And release! What more can you ask for on a fall day? 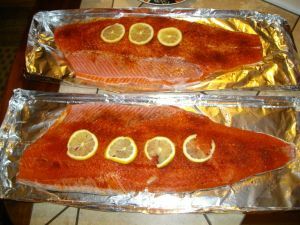 One of the delicious grilled salmon dinners! A departure party included! 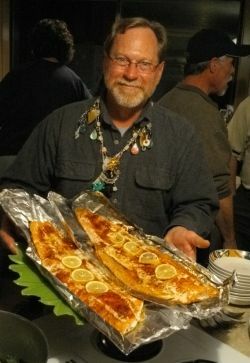 This was the biggest whole fish Robert brought back, then filleted for tonight! Grilled and ready to serve! Robert and Mary Jo now? Click above to see an interactive Google map of their last known location. You are currently browsing the rmjontheroad.com weblog archives for November, 2012. About Robert and Mary Jo. July 2 = Happy Anniversary! June 26 – We Completed the Trail! June 20 – More Food Fotos!